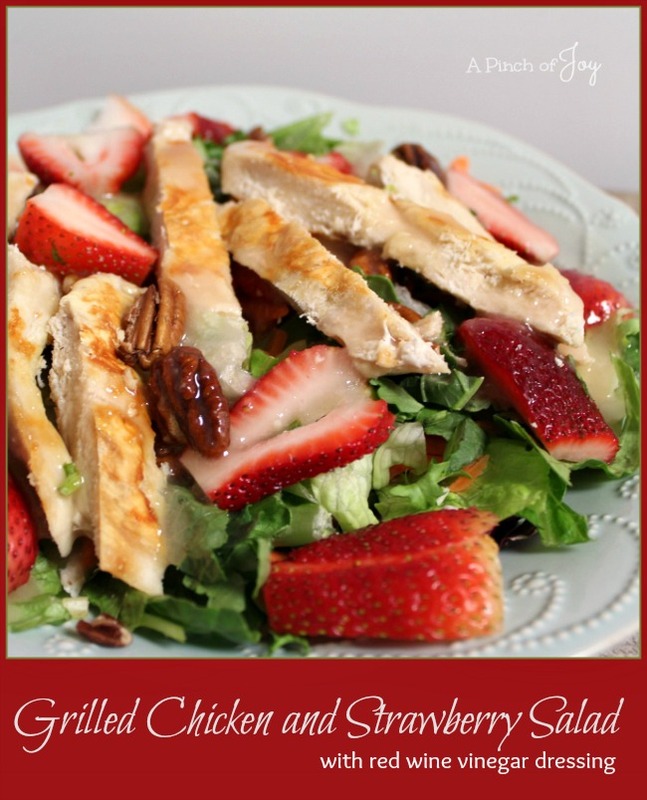 Grilled Chicken and Strawberry Salad is a springtime hit with berries fresh from the garden and fresh salad greens. Of course, you can make it any time of year with berries and greens from the grocery. Use your favorite salad greens. Leaf lettuce or Bibb lettuce from the garden, spring green mix, iceberg pieces, spinach, romaine. Or a mixture of any mild flavored green. Add a handful of chopped kale to each plate, if you like. Generally, a serving of salad is about one cup (pressed down) of fresh greens. Or, the number of servings in a 16 ounce bag of greens is often listed as six. This recipe will make 6 side salads or three generous dinner salads. The dinner salads are the choice at our house. The dressing is the star of the show. And I don’t eat dressing on my salads!!! I’ll have ranch on the side occasionally, dipping my fork in the dressing before spearing a bite and that’s it! But this tangy, sweet, oniony concoction is delightful! I think you’ll really like it, too! Grill chicken about 6 minutes on each side or until juices run clear. Remove from heat to cool. While chicken is grilling, prepare dressing. In blender combine olive oil, onion, mustard, salt and pepper. Process about 10 seconds to thoroughly mix seasonings and onion. Add red wine vinegar and pulse two to three times to mix in. Add one half the sugar and process 5 seconds. Add last half of sugar and process for 10 seconds or until sugar is thoroughly dissolved. If desired, toast pecans by heating over medium high heat until fragrant, about 6-8 minutes. Remove from heat and set aside. Arrange salad greens on serving plate. Slice grilled chicken. Add chicken, strawberries and pecans to each serving plate. they look so beautiful. I have never tried to add fruits in my salad although I adore salad recipes. But this one ? Must be tried. I think it will taste yummy.